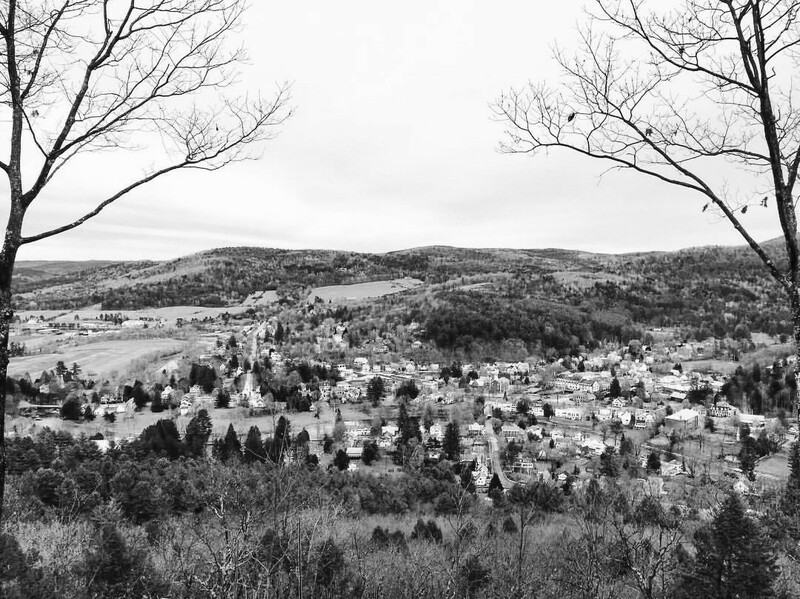 Winter brings new life to Woodstock. The days of watering holes and ice cream are replaced by icy ponds and hot cocoa. Warm breezes transition into cool gusts. Once green meadows are blanketed by a glistening layer of frost or snow. In typical New England fashion, a new season brings with it fresh scenery. And we Vermonters celebrate in this fact. We get our outdoor time all year round, regardless of the heat or cold. We are lucky enough to have the perfect remedy to our eager legs right here in town. Mount Tom offers various levels of activity, along with a large helping of historical backstory. 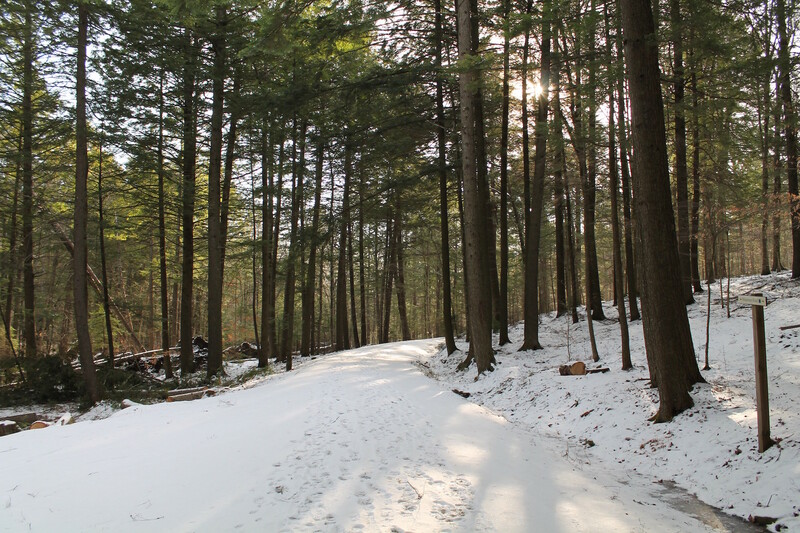 As part of the Marsh-Billings-Rockefeller National Historical Park, Mount Tom is one of the oldest professionally managed forests in the country. Once the childhood home of George Perkins Marsh, an American conservationist pioneer, and later home to Frederick Billings, the property was made public by its most recent owners, Laurence and Mary Rockefeller. The park now symbolizes three generations of conservationist thought – emphasizing the idea of place, as well as the preservation of natural resources within the 21st century context. 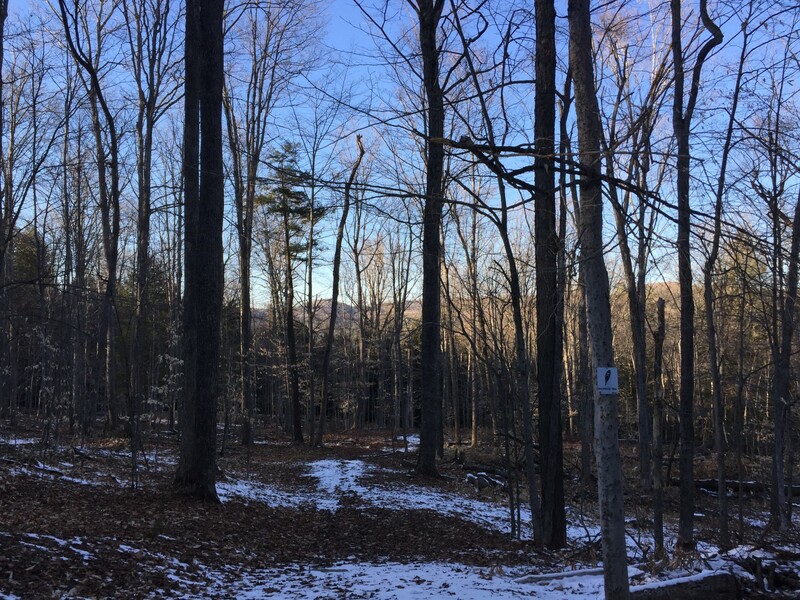 The park lies adjacent to Billings Farm & Museum and surrounds the Marsh-Billings-Rockefeller mansion, encompassing 550 acres of managed woodlands and mountain slopes. Billings initiated the replanting and management of the forest, and such practice continues as an important mission of the park. Billings also built roads on the mountain in the 19th century to encourage the public to walk through and appreciate the managed forest. While there are a few major ways to meander the park, we highly suggest passing on the switchbacks of Faulkner Trail for a casual hike and opting for the more manageable carriage road (especially in wet or snowy conditions). The carriage trail can be found next to the mansion, across the street from the Billings Farm roadside cows. Just to note – there is another entrance on the western side of the park, closer to our inn! Across from the Woodstock Farmer’s Market, make a left turn on Prosper Road and you’ll find a parking area right off the street in about a mile’s drive. You can head into a couple of Mount Tom’s trails from there. 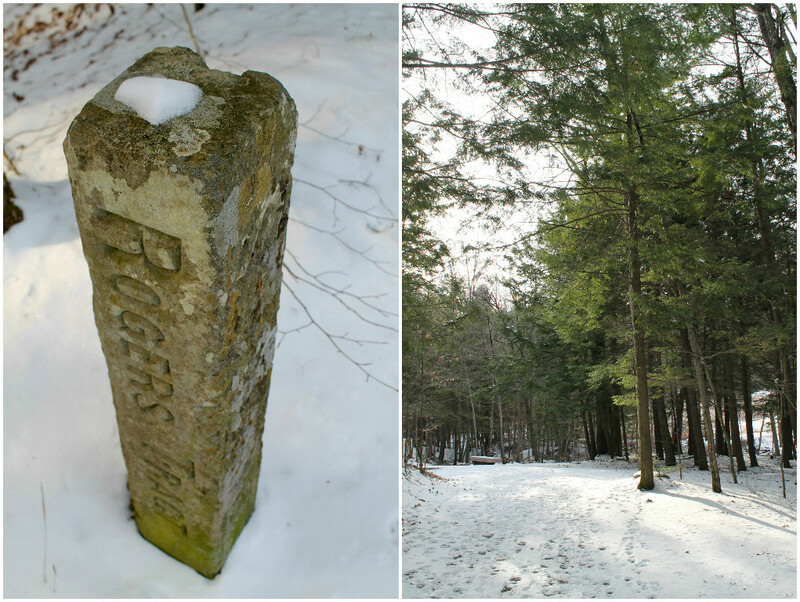 As seen on the parking area’s trail map, a carriage road is not too far from this trail head. The Carriage Barn Visitor Center sits at the very beginning of the carriage road near the mansion. Constructed of white pine harvested and milled from its surrounding forest, the center also houses benches, chairs, tables, and bookcases made by local craftsman. 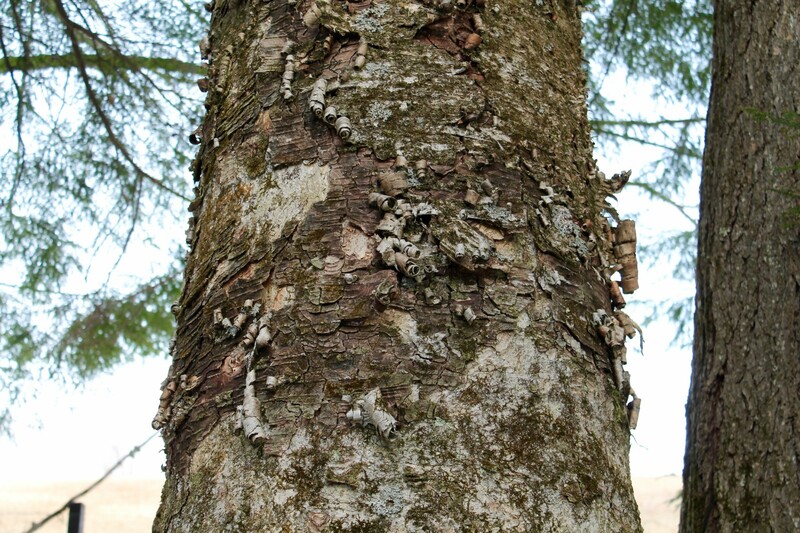 Within the center, you’ll find a historical timeline of the families who played a vital role in the park’s establishment, as well as the details of their sustainable forestry operations. Draft horses, for instance, were used in the 1800s for logging. The horses would transport felled trees, causing minimal impact to the forest. The park recreates this process every autumn during Woodstock’s Forest Festival Weekend. We equate hiking the carriage trail to a scene out of The Hobbit. More than a few spots on the trail allow a view into the forest that is nothing short of full-fledged Shire status. 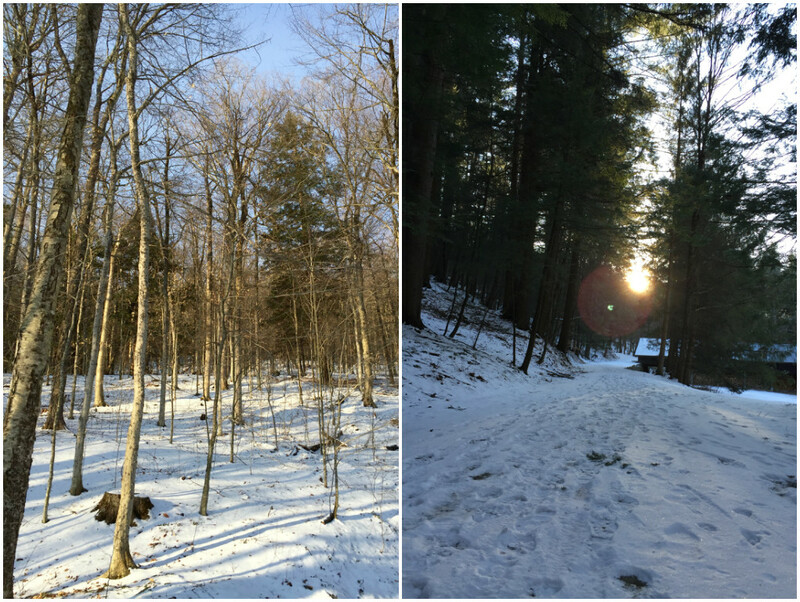 In the winter, trails are even more magical. 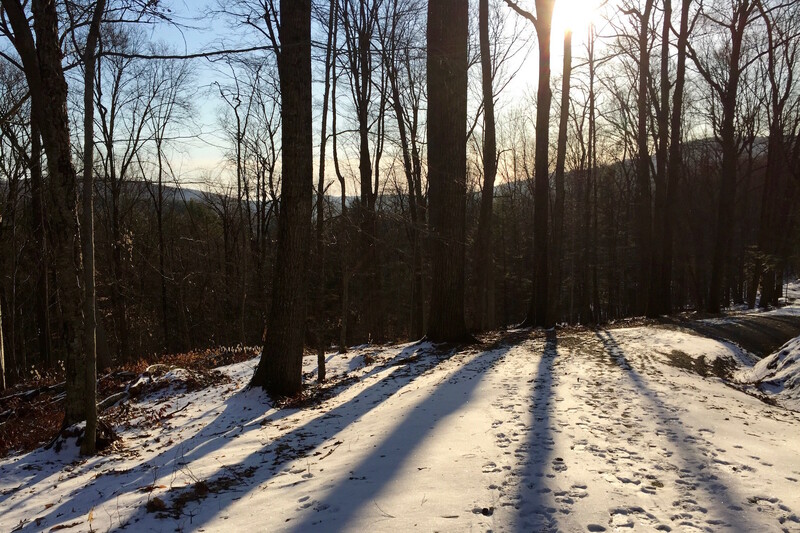 As the ground crunches beneath our boots and the sun shines on a blanket of snow before us, we are astonished by the pure serenity found mere minutes from the Woodstock Village. Before making a left turn on the road to the summit, we suggest walking further ahead a bit to admire the Pogue, a 14-acre pond nestled in the forest. You can walk the trail lining its perimeter. Be on the lookout for an occasional bench with inscribed quotes along the way, a result of the park’s collaboration with area artists. Backtrack to the carriage road, toward Mount Tom’s summit. Here, you’ll find the perfect viewpoint of the Village and Main Street. Woodstock looks like its own version of Whoville below. 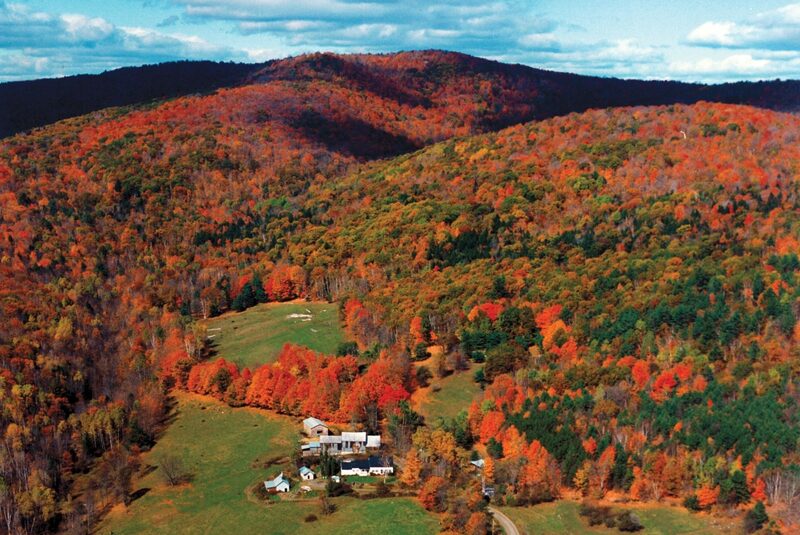 Beyond, you can spot Killington amongst rolling hills and vast meadows. If snowshoeing or cross-country skiing is more your style, check out Woodstock Inn’s Nordic Adventure Center. For a fee, you gain access to their groomed trails throughout the park. Look at their Conditions section for regularly updated trail conditions. Small signs denote groomed trail heads, where maps are also provided. You may rent equipment through the inn’s Nordic Center as well. 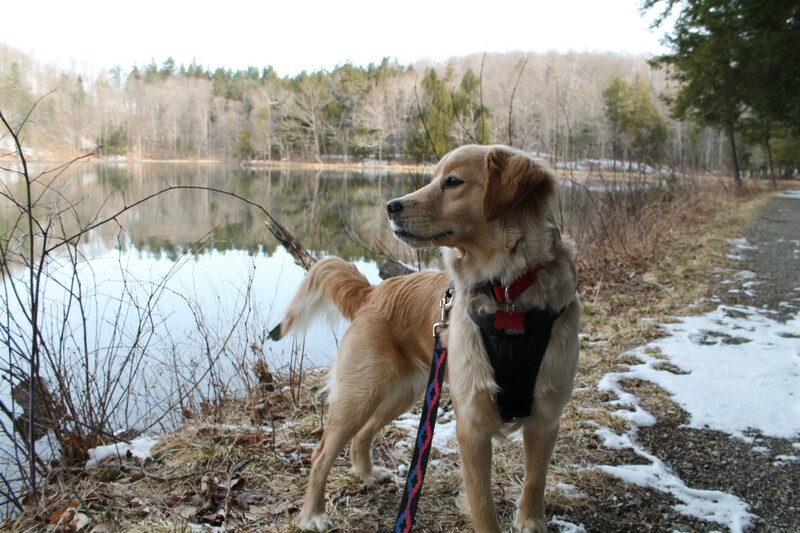 Did we mention that your furry friends are allowed on the trail too? Leashed, of course, you can tucker out your pups while getting your own dose of exercise! Mount Tom even supplies a few leashes at the beginning of the carriage road for public use. Plan on at least a couple hours of hiking time if you decide to relaxingly enjoy your journey. Mount Tom is a top pick for us here in Woodstock, every season. Get out and bask in the beautiful wintery weather we have here in Vermont!